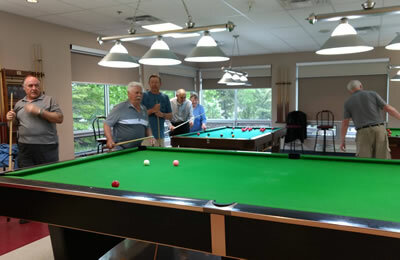 We have a fine Billiards room in the Seniors Centre with four tables. Two of these are for snooker or billiards, and are full size 12-foot competition tables. One is a smaller 9-foot snooker table, which is just right for beginners, and the remaining table is a competition size 9-foot “pool” table for 8 or 9 ball. The room is used by a friendly crowd and new members are made welcome. There is plenty of opportunity to come in and have a game, or to learn the game if you are a beginner. We have a few volunteers who can introduce you to the existing players. Cues are available, or bring your own.